I’m happiest when I’m creating something. Although I have two creative jobs – a full-time gig as an event planner and a side photography business – I still see crafting as my ‘hobby’. I call this hobby Thrift D’ Creations and share it with a Facebook page and an Etsy shop, where I sell my wares. 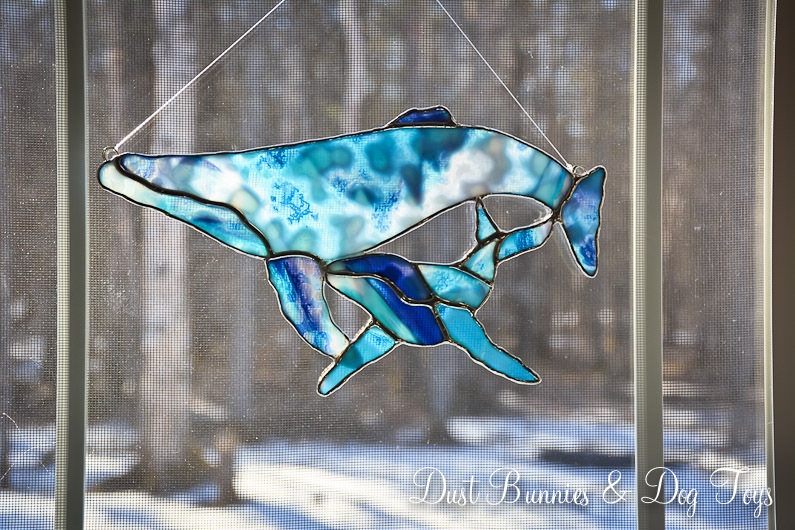 I have also showcased my work at local craft bazaars for the past several years, but the cost and time involved became overwhelming. So I decided to limit myself to two shows a year – one in the fall for Christmas and one in the spring for Easter and Patriotic holidays. Luckily, now that we’ve moved to a new city, I’ve found two such shows just 15 minutes from home. Both have reasonable booth fees and draw a sizeable audience, which is not always the case, so I’m thrilled to be involved. Tomorrow is my spring show, the Gifts Galore Bazaar, which benefits the Cystic Fibrosis Foundation. Held at a local high school, there is room for over 70 vendors, including everything from hand-made items to Tupperware. Besides creating all the inventory for my booth, the biggest investment has been determining how I’d set up my booth. I decided to split a booth between my photography and crafting so it’s a business expense. 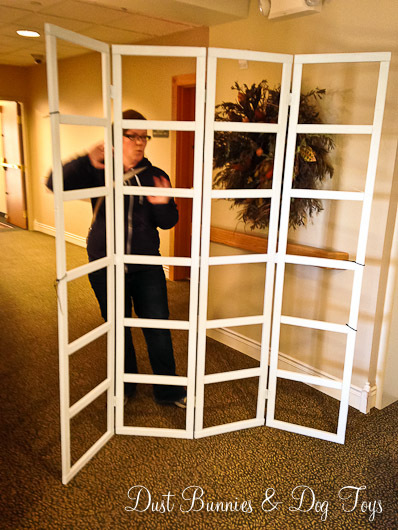 I had originally planned to use free bi-fold shutter doors I’d gotten on Craigslist as a backdrop for my booth, but then I spotted a gal at a recent show with this display. Although I’m still working scarves into my regular wardrobe, I’ve somehow amassed quite a collection. 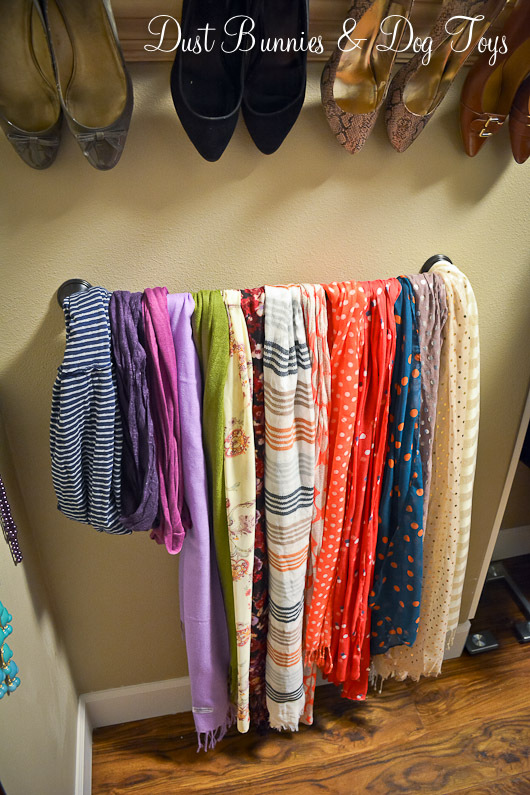 I used to have a scarf organizer similar to this that hung from the closet rod, but I found that it was too full and I couldn’t easily find scarves that were buried under those on spots higher up. My next option was draping them in a row over the closet rod itself since I had extra space to use. This worked pretty well, but I worried that the wooden rod would snag the scarves as I pulled them off if I was in a hurry. So when we removed the builder’s towel bar to use hooks in the Master bathroom I had a light bulb moment. 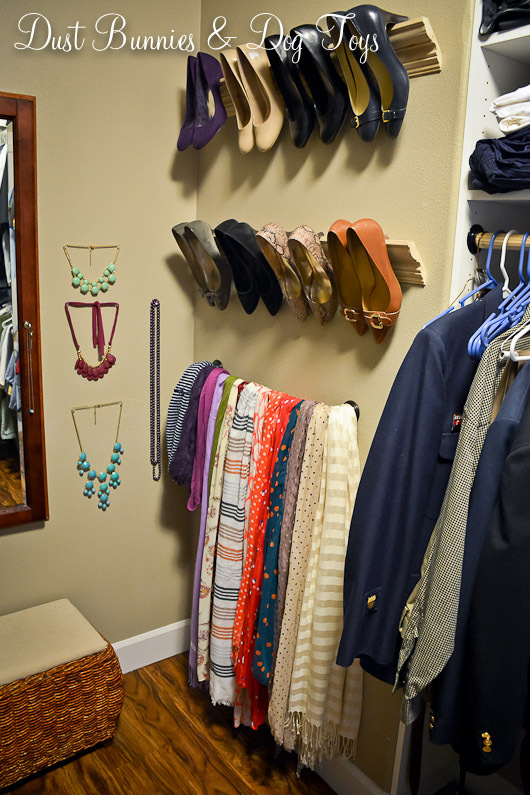 I asked the hubs to hang the bar in the closet below my crown molding shoe racks instead. He looked at me like I was mad until I explained what I planned to use it for. 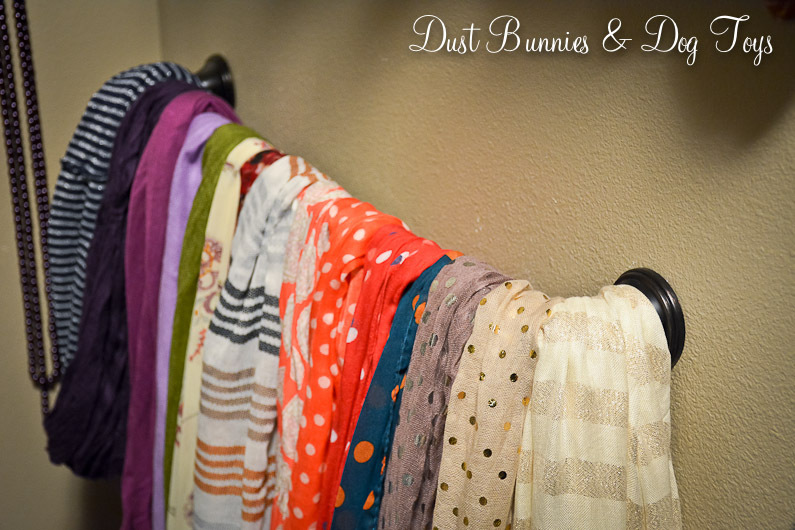 A stud finder and a couple screws later, I now have a pretty and functional scarf bar in my closet. I love the location because it’s right next to my mirrored jewelry cabinet which I stand in front of to decide on accessories for each outfit. And because it’s right under my shoes I can see how everything will coordinate as I pick out options. Spring Fling? More Like Break-up! 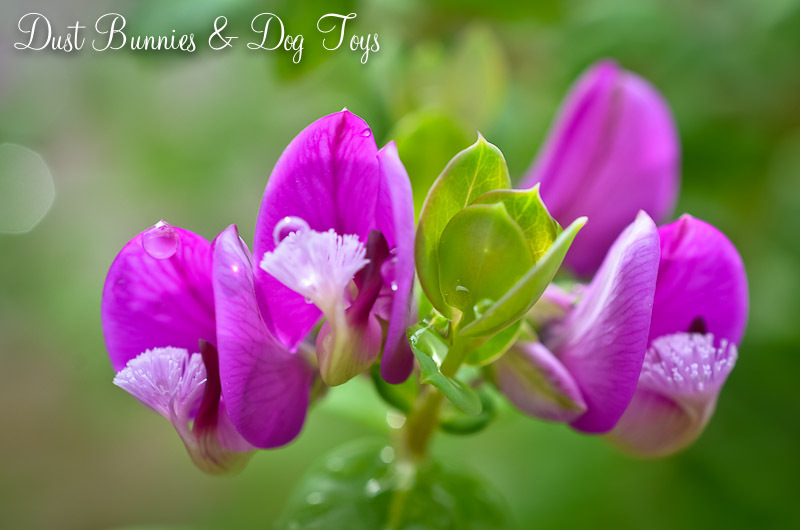 Tomorrow is the first official day of spring, but we do everything a little different here in Alaska, including Spring. When you live near the Arctic Circle spring doesn’t include pretty little green sprouts popping up after misty rain showers. Here, spring brings a continued chance of snow, slushy roads edged with puddles and grey everything – not the 50 shades kind either. Spring is known as “break-up” season in Alaska, because that’s when the ice on the rivers starts to break apart and move downstream. In fact, traditions are based on it. Many native villages hold contests for residents to guess when a wooden tripod placed on the thawing river will fall as the ice below it gives in to rising temps. It’s usually the talk of the town and you’ll find everyone available on the river bank watching, because it’s what you do in rural Alaska. 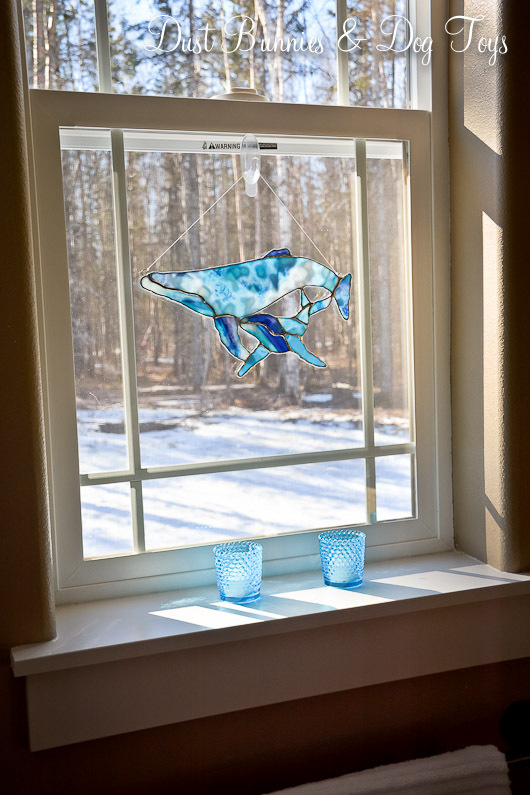 One of the things I love most about Alaska is the change of seasons, but now that the beautiful snow of winter is melting and we’re left with wet, slick ice splotches I’m ready to fast forward to summer’s greenery. Maybe it’s spring fever because I didn’t get a “spring break” like the school kids did. Or maybe I’m just eager to get my garden set up and my landscaping installed. 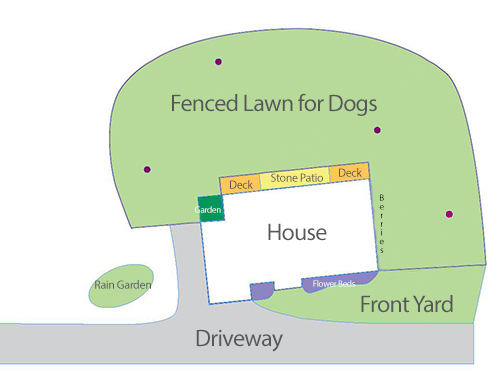 I have big plans for the yard, including hydroseeding a lawn for the dogs, flower beds near the front door and several birdhouses with feeders nearby so our feathered friends stay. Watch for a post on the full plan soon. But none of that can happen until the ground thaws and the warm temps are consistent. Until then my ‘yard pretties’ will remain stashed away in their cabinet in the garage and I’ll continue to day dream about the pretty flowers I’ll be planting. Because neither of us have Irish heritage and we aren’t big drinkers, St. Patrick’s Day isn’t a huge to-do in our home. Regardless, I still like to put up a little green here and there. 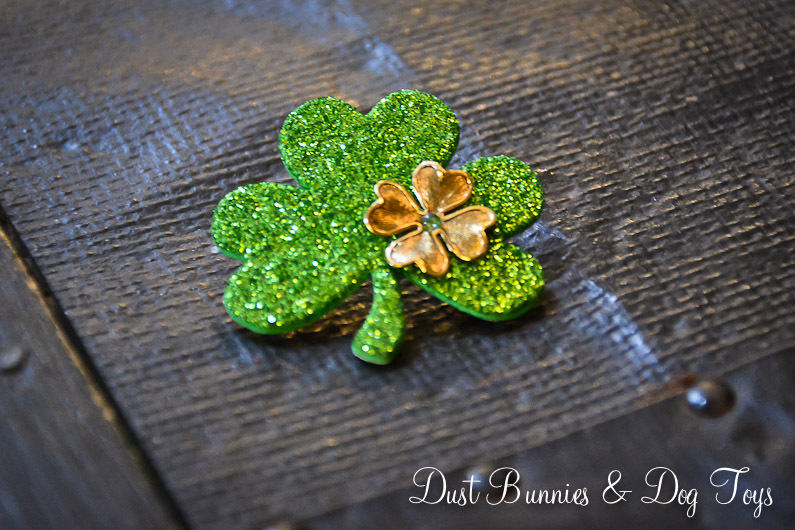 I usually round up whatever green and gold décor pieces I have lying around and mix them together with the small stash of stereotypical St. Patty’s theme items like leprechauns, gold coins and rainbows I’ve accumulated over the past few years. 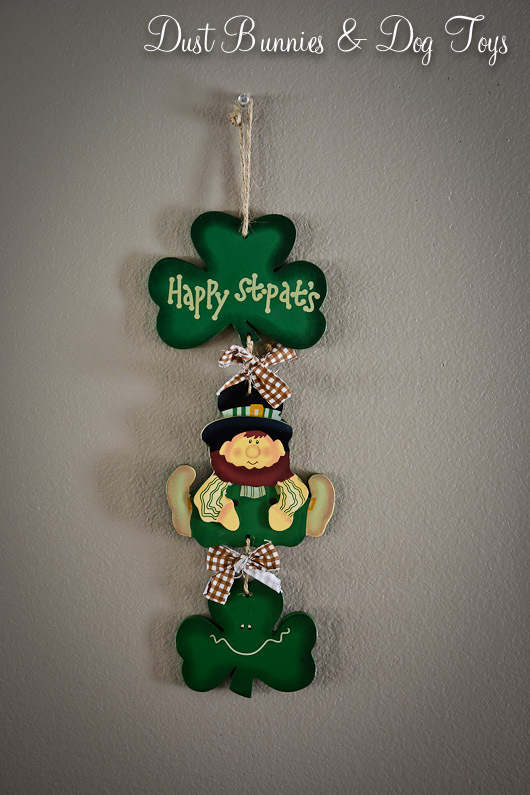 Here’s what I came up with this year to bring a bit of luck to our home. 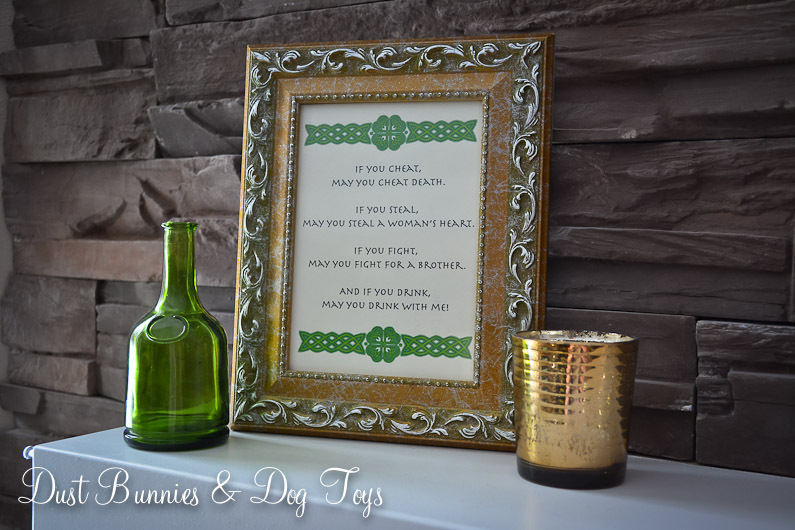 On one side of the mantel I used a framed Irish phrase I found online and printed with some Celtic graphics for a border along with some green and gold accents. 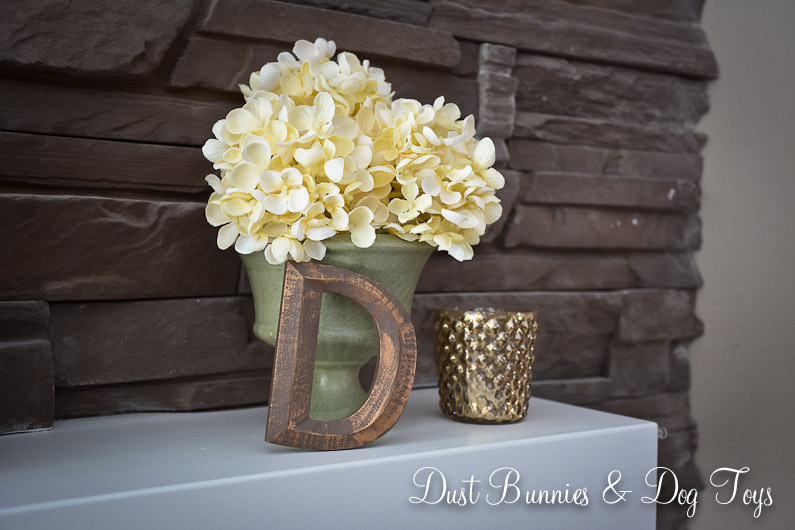 The other side holds my newly thrifted green vase with some white hydrangeas, another gold votive and our pretty D monogram which has hints of gold to it as well. 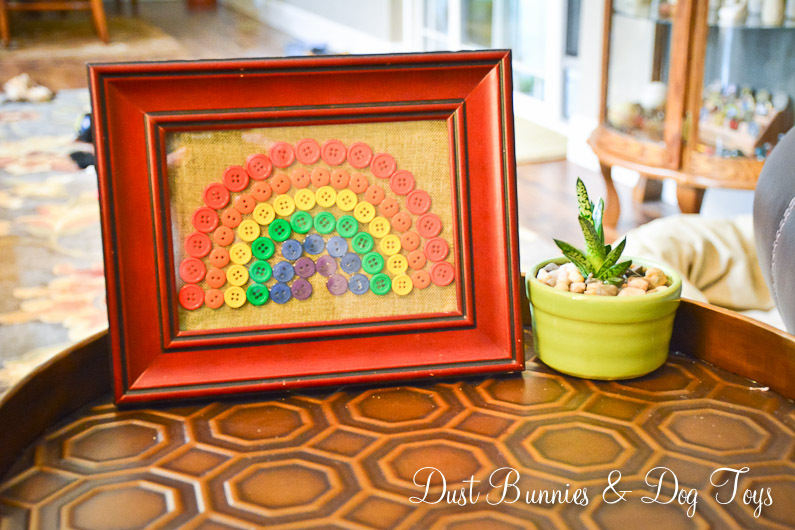 The button rainbow I created a few years back fit perfectly on the little side table between the chair and couch. A little potted succulent next to it added a bit more green. The space on either side of the TV got a little attention with more mix and match green and gold. 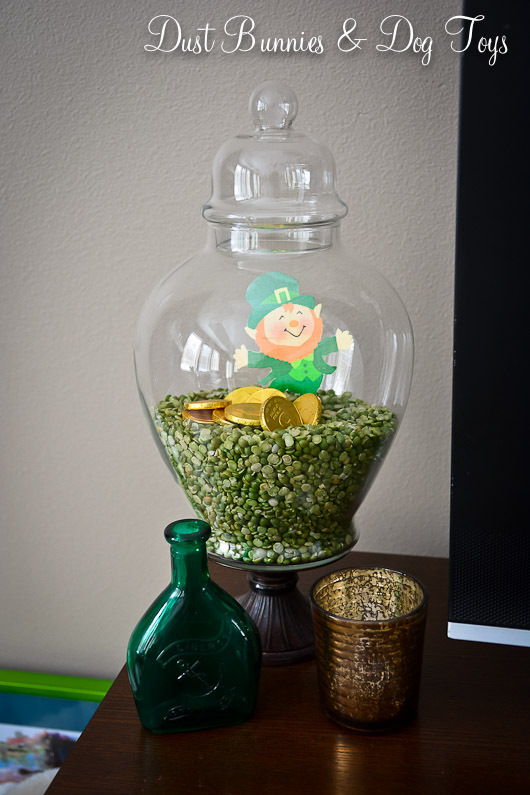 Split peas in a glass jar keep my little leprechaun contained with his gold. 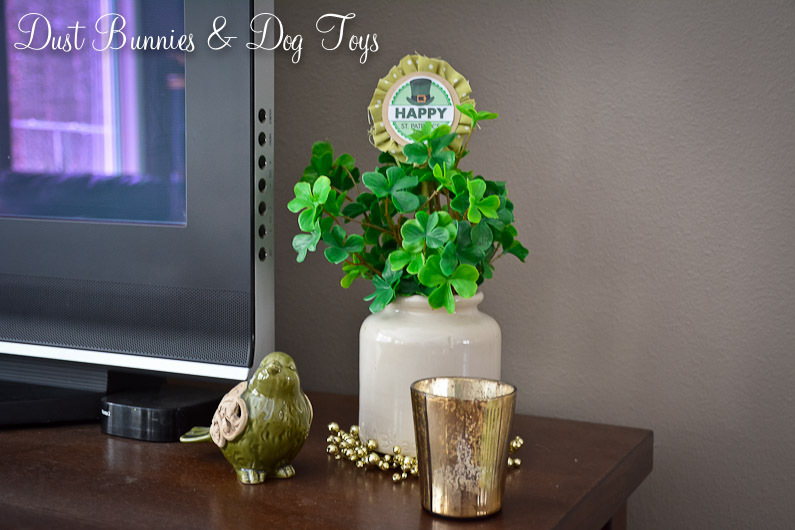 I also paired a white crock I picked up at a thrift shop recently with faux clover I found on sale at JoAnns last month. A pretty green bird and some more gold votives finished off the look. 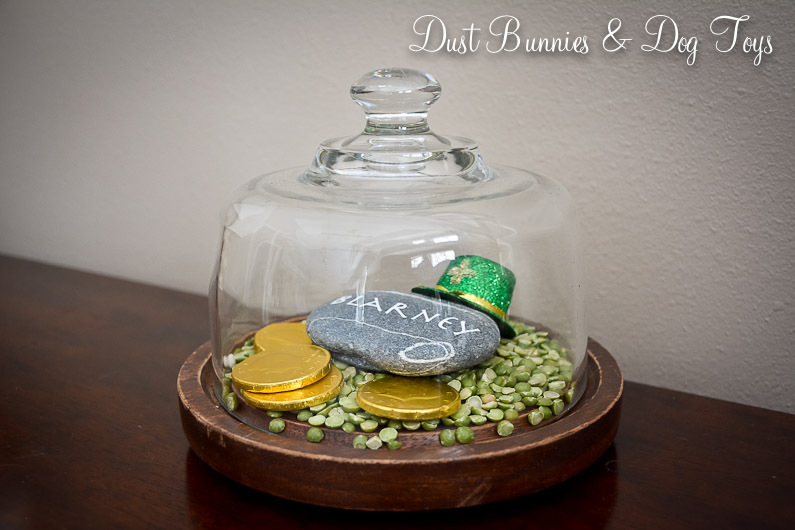 I made this blarney stone back when we lived in Kodiak and love how it looks with gold coins in this pretty cloche which I placed on the buffet in the dining room. 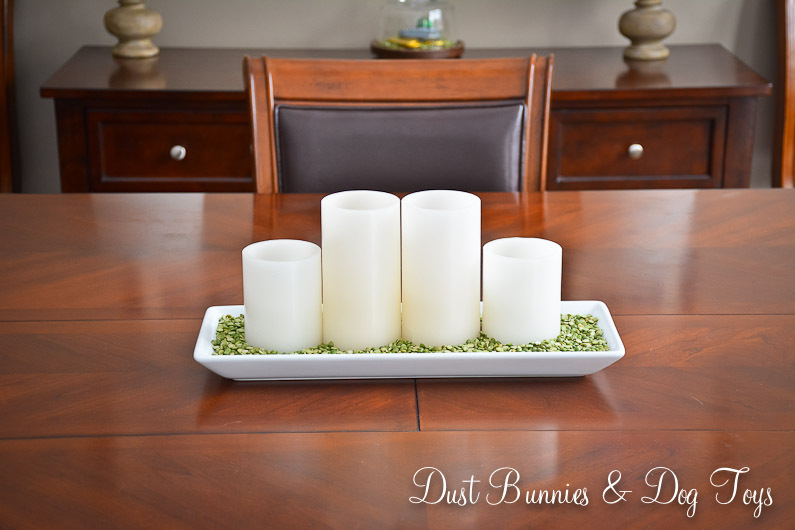 More split peas in a white tray with white pillar candles makes a super simple, but elegant centerpiece. 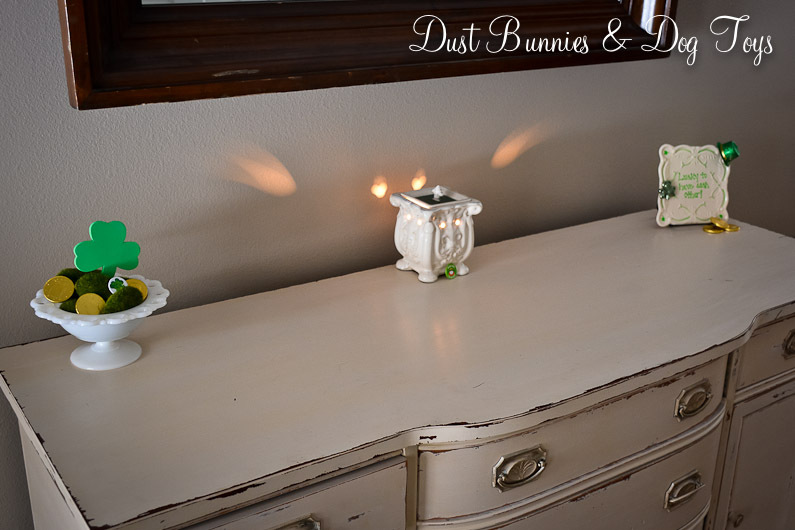 The entry way was the refuge for all the left over green and gold, which I compiled into two little vignettes around my green filled Scentsy . It was also the perfect spot to hang my lucky leprechaun sign. Do you do something fun or unique to celebrate this fun holiday? Leave a comment and tell me about it!